Surely one of the finest puds: classic, velvety and oozing with zesty lemon. 1. Preheat the oven to 100°C, gas mark 1⁄4. Using a balloon whisk, gently mix together the eggs and caster sugar, being careful not to incorporate any air. Add the lemon zest and juice followed by the cream and mix until well combined. Add a tiny pinch of salt. Transfer to a small container and allow to settle. Lift off any surface bubbles with a small spoon. 2. Pour the mixture into 4 ovenproof ramekins (about 200ml in volume) and bake in the oven for about 45-50 minutes. (The time will vary according to your oven but aim for just set in the middle; they are better a minute undercooked than overcooked.) Remove from the oven, leave to cool completely, then chill for about 2 hours. 3. Sprinkle an even coating of the demerara sugar over each cream and wipe any excess from the sides. 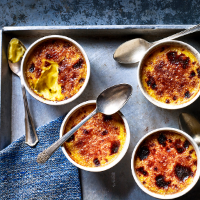 Use a kitchen blowtorch to caramelise the sugar until it’s a rich golden colour, or put the ramekins under a very hot grill for 2-3 minutes. Allow to set before serving.